Mark, a new member on DB introduced himself the other day, and presented these pictures of his first bike build. Bought off of The Bay Of Fools, it has been towing a sidecar around in Vintage Racing for a while. The thing that will have the rivet counters biting the ends clean off of their pipes is the fact that it is a 1939 500 twin. 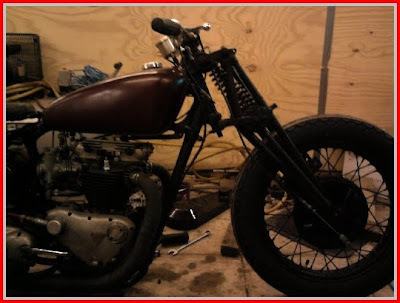 Now I don't know a lot about Triumphs as early as this, but I do know that they are few and far between. The timing cover looks different that's for sure, the breather bulge at the back and the boss at the front have been welded on. 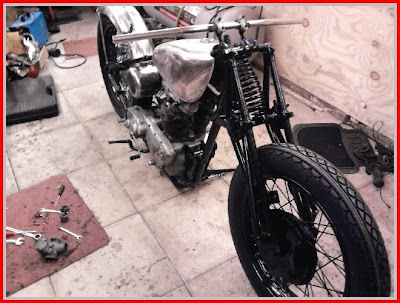 The oil tank looks suspiciously like a one gallon GP item, the head must be fitted with manifold adaptors, mustn't it? What are the extra spars on the side of the girders? Put on to improve lateral strength for outfit racing no doubt, but by who? It needed a bit more than that but the engine runs great and was running on methanol which was fast.I don't know too much about triumph engines but it is a 650 with mount everest pistons and race cams. 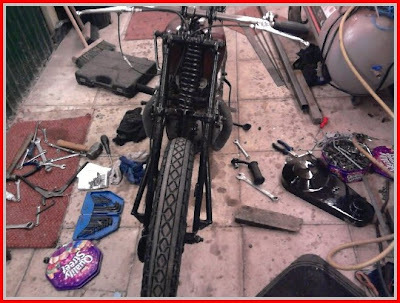 I had to install all the kickstart stuff as it did'nt have any,and made sure i could kick it over and start it which i did. I've rejetted for petrol and have a BTH Magneto to fit.I'm going to run it with no lights so no headaches there. who have issued me a dating certificate so i can get a period reg.WHich should be soon.And i can't wait. 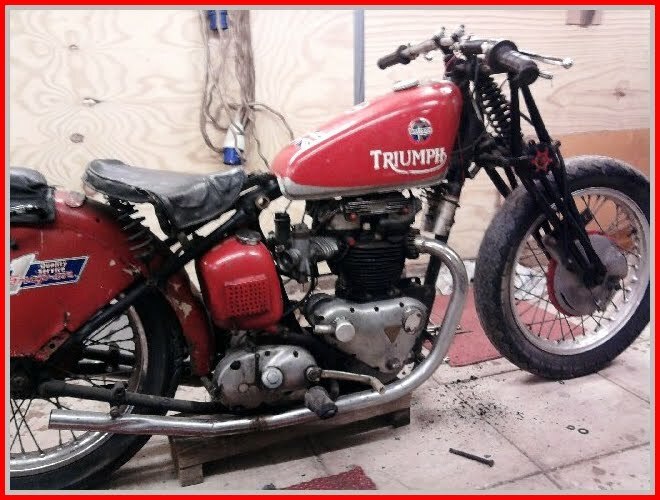 So, all you Triumph men out there who couldn't resist looking any way, what do you reckon it is/was ? 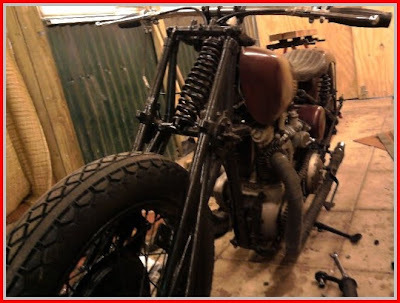 Is that bike here in the UK? ;) Are you reading my mind yet?